There's only about a month left of summer. And it is imperative that you use this time wisely -- by eating ice cream. But where to start? Where to go? What flavor of ice cream to eat? Worry not. 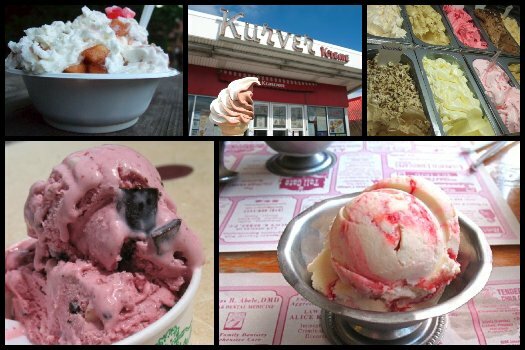 We've put together an ice cream tour of the Capital Region to aid your pursuit of frozen deliciousness. We suggest you start today. Summer won't be here for long. Crisan is in my block: how they manage to keep their pastries so cheap is a mistery, and their ice-cream is indeed delicious. No Coney Express!? That place is an institution. It always has a longer line (even in bad weather) than these places which says quite a bit. You also forgot Tastee Freez! I think their soft serve is way better than Kurver Kreme. It's 58 Delaware Ave, Delmar, NY. poppy's ice cream in schenectady (7 Old Mariaville Rd - 518.356.1056) should be on the list - it is definitely out of the way (well, from troy, anyway), but the peanut butter chocolate moose tracks is totally worth the ride. they even have frosty paws ice cream treats for dogs! Do any of these places make their own waffle cones? There's nothing better than walking into an ice cream shop that smells like freshly made waffle cones. i'm with skfl on the poppy's props. (maybe that's because i "drag" him there from time to time) but curry freeze is also worth a trip out to rotterdam. i think they have the best soft serve around here. and it's right around the corner from napoli bakery. napoli bakery! I went to Moxie's on your advice; the ice cream was great, and I'm glad we made the drive. But I want to warn fellow AOA readers that there were only three flavors of vanilla left. Apparently, as the season wanes, flavors run out and are not replenished. So if you're interested in the "vanilla sampler," you'll have to wait until next spring. Meanwhile, the chocolate and black cherry were wonderful.